Our canoe biking trip was a success. 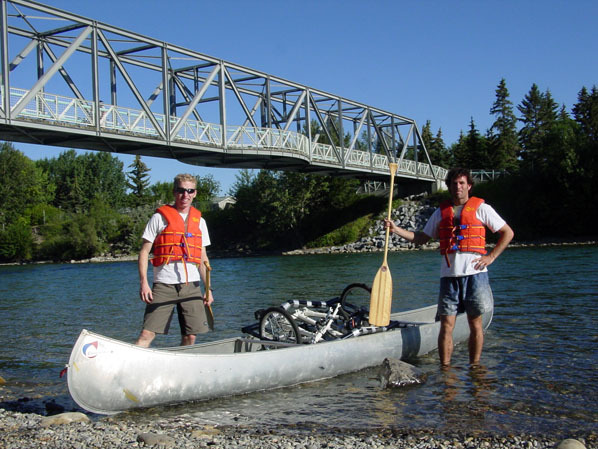 Here’s a photo from just after we pulled our boat out in downtown Calgary and started our final bike ride back to Gary’s place. The full story from our trip is posted at: www.bikeforest.com/canoe. Here’s a video of some of the highlights. The past couple of days have been a little stressful. I built my canoe trailer in Ontario without having seen either the canoe or the tandem bike we planned to hitch the trailer to. I’d designed a custom BOB trailer style hitch to hook onto a standard BOB quick release skewer. 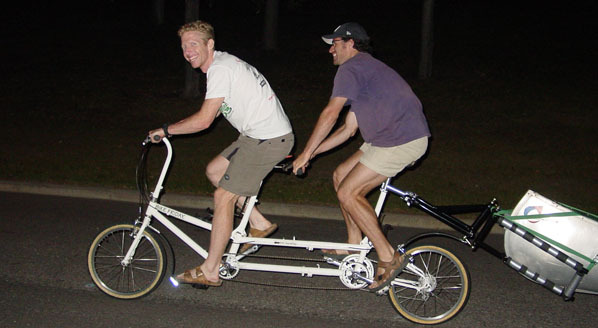 I didn’t realize until I arrived in Calgary that our tandem had an internal hub. BOB makes special nuts for use with internal hubs, but we couldn’t source any in Calgary. In the end, we resorted to mounting a stem on the stoker’s seatpost and sliding our BOB quickrelease through a cut down handlebar. It’s not elegant, but it seems to work. We took the trailer out for a test ride up and down a local section of the Bow River and all systems are a go. We should be good to leave tomorrow. You are currently browsing the Bicycle Forest Blog weblog archives for August, 2003.